© JONATHAN ERNST / REUTERS U.S. President Donald Trump speaks during a rally with supporters at Phoenix-Mesa Gateway Airport in Mesa, Arizona, U.S. October 19, 2018. President Trump is in Elko, Nevada, Saturday to rally for Sen. Dean Heller and other Republican candidates in the state. It's his third campaign rally in three days. He was met with an enthusiastic crowd who often interrupted his speech with cheers. Heller is facing Democratic Rep. Jacky Rosen and is considered the most vulnerable Republican up for re-election in the Senate this year, as Hillary Clinton won Nevada in 2016. 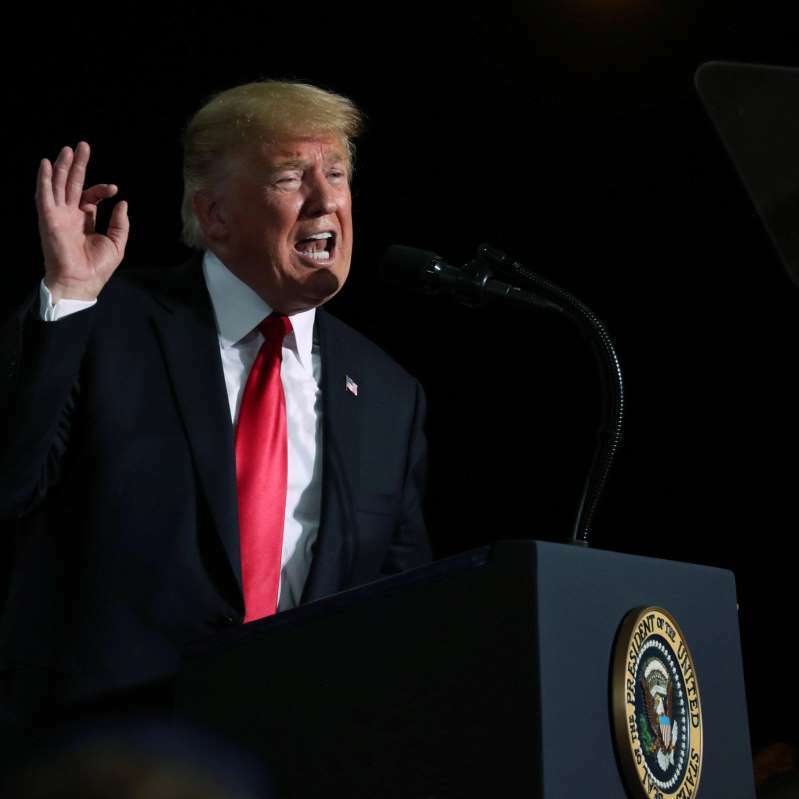 Mr. Trump has ramped up his campaign presence in the month before the midterm elections, urging large rally crowds to turn out to vote and ensure that Republicans keep the majority in Congress. He often spends much of his rallies condemning Democrats, accusing them of being a "mob" unfit to govern. He repeated this message at the rally in Elko Saturday, pointing out that early voting begins on Saturday in the state. "The Democrat Party has become an angry, ruthless, unhinged mob determined to get power," Mr. Trump said. He repeated a new talking point he has unveiled in recent rallies, urging Republicans to vote for "jobs, not mobs," adding that the so-called blue wave was being "shattered." He asked rally goers to immediately go and vote. Mr. Trump also repeated some direct quotes from earlier this week. "This will be an election of Kavanaugh, the caravan, law and order and common sense," Mr. Trump said in Nevada, just as he did in Montana two days earlier, referring to Supreme Court Justice Brett Kavanaugh and a caravan of migrants from Honduras on their way to the American border. Mr. Trump brought Heller to the stage, joking beforehand about his initially frosty relationship with Heller. "Once we understood each other...there's no better partner that I had in Washington," Mr. Trump said about Heller. In his speech to the crowd, Heller attacked Rosen, saying that she was only willing to campaign in Las Vegas, which trends Democratic. Mr. Trump also stumped for Republican gubernatorial candidate Adam Laxalt during the rally, whom he brought to the stage at one point. Recent polls have shown a tight race between Laxalt and Democrat Steve Sisolak. Heller and Rosen met at their first and only debate on Friday, where the two traded barbs and interrupted each other often. Both candidates touted their bipartisanship, though when asked what could be done to ease political gridlock in Washington, Heller echoed Mr. Trump by blaming the media for divisiveness in the country. At one point, Mr. Trump solicited the audience on what nickname he should use for former Vice President Joe Biden, who visited Nevada to stump for Rosen on Saturday. He asked the crowd whether the nickname should be "Sleepy Joe" or "1 percent Joe," due to his failed presidential attempts. Recent polls have shown the race between Heller and Rosen tightening. A recent New York Times/Siena College poll showed Heller two points ahead among likely voters. The CBS News Battleground Tracker rates the race as a "toss up." Earlier in the day, Biden echoed Mr. Trump's talking points on the need to vote, albeit for politicians on the opposite side of the aisle, saying that "you've never participated in an election as consequential" as the one in November. Mr. Trump visited Las Vegas in October to rally for Heller and other statewide Republican candidates. The president criticized Rosen at the rally, calling her "Wacky Jacky" and saying that she would never vote with the president if elected to the Senate. Mr. Trump began his western campaign tour on Thursday, when he rallied in Montana in support for Republican Senate candidate Matt Rosendale, who is challenging Democratic Sen. Jon Tester. Although Mr. Trump won Montana by 20 points, a September CBS News Battleground Tracker poll last month showed Tester leading Rosendale by two points. The CBS News Battleground Tracker rates the race as "Edge Democrat." Mr. Trump also focused heavily on illegal immigration in this rally. On Friday, Mr. Trump rallied in Mesa, Arizona. He was promoting Republican Senate candidate Martha McSally, and spent much of the rally talking about undocumented immigrants, resurrecting the phrase "bad hombres" to describe criminals entering the country illegally.